Martens, originally from California but now a resident of Leeds, Ala., wasn’t sure how much his limit weighed - it’s difficult to judge weight at a tournament where winners can be decided by ounces. But his bag included a 6-2 largemouth that was second only to Seth Feider’s 6-4 bass, which won the Phoenix Boats Big Bass Award of $1,500 for the tournament. Martens also set a unique B.A.S.S. 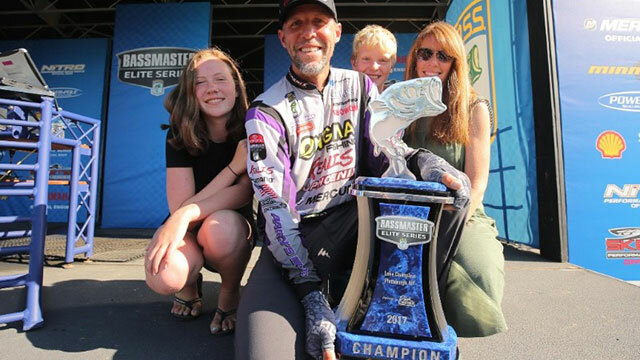 mark today: He climbed 19 spots on the final day to win an Elite event - a feat made possible because this weather-shortened event spanned three days, instead of four, and the Top 51 anglers fished the final day, instead of the traditional Top 12.